What is your step pattern after leaving the blocks? Powerful and wide, or narrow and close to the center (imaginary line between lanes) as possible? Along with a good reaction time, Coaches usually instruct athletes that a narrow step width and a high step frequency are required for a good start in the sprints. Now let’s look at step width coming out of the blocks. Both Tyson and Usain come out of the blocks with a slightly wider step width than Lemaitre. Note how Mo Green “drifts” to his left, and here is Asafa Powell’s early years. This video has a great montage of Asafa Powell in his later year. You can see his left leg “going wide” which I attribute to his Jamaican toe drag, along with increased power and strength over his career. Of course, this comes at a cost of an increased ground contact time. Towards the end of this video, you can see Olusoji Fasuba with a straight line approach. Perhaps we can get his coach Pierre-Jean Vazel to comment on this. READ 5 Minute Max Squats Bodyweight: Cyclist, Powerlifter, Strongman. Who Wins? These results indicate that a wide step width may be best suited for developing driving force during the long foot contact periods in the acceleration phase. 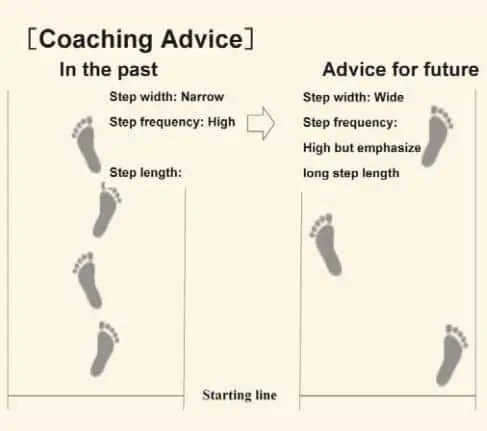 On the other hand, a narrow step width may be best suited for developing driving force during the short foot contact periods characteristic of full stride sprinting. However, the full mechanisms of the optimal step width changes need further clarification and research. 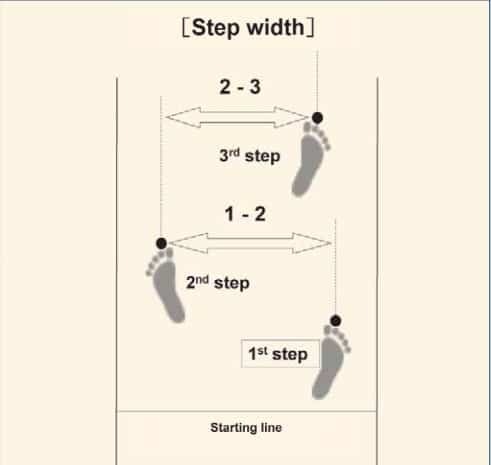 it could be advisable that step width be maximised during the first steps and then gradually decreased from about 0.4m (in the first steps) to about 0.17m (in full stride running). THE BOTTOM LINE: Step width and frequency depends on the strength and power of the athlete, along with the leg recovery… that is, being in the correct biomechanical position upon ground contact. 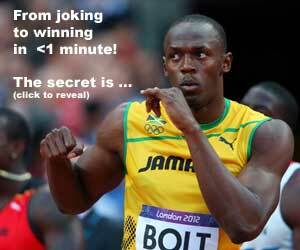 This brings back the argument for using the Jamaican toe drag, which I’ve also covered in past articles.